This is a quite famous design by Graham Byrnes of North Carolina and the design has won several of the WaterTribe races in both NC and Fla. The builder (see link below) made several design modifications to the boat and added lots of brightwork instead of paint. The hull is made of okoume marine plywood, the keel, transom and bow stem are made from Sepele. The deck is Douglas fir and alternate sepele strips and the seats are yellow pine. The spars and sprits are spruce with sails that reef by rolling around the masts. 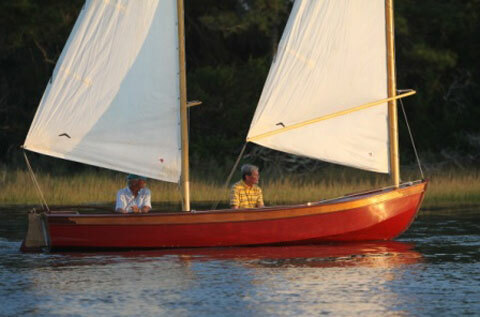 This is a very light boat and moves along in even the lightest breeze. A great sailing boat! Comes with a trailer, a tarp cover and a matching wood canoe paddle for when the wind just dies.